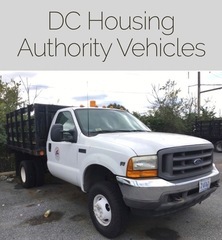 M21897 DC Housing Authority excess equipment, Step Vans, Stake Bodies, Dum Trucks, SUVs, Cars and Specialty Equipment sold to the highest bidder. Preview onsite. AUCTION CLOSING DATE: Wednesday, November 14th at 11:07 am. Bidding closes on the first item at 11:07 am, then closes at the rate discussed in these Terms and Conditions of Sale.